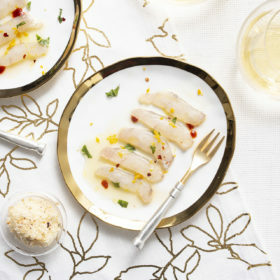 The recipe from NYC's I Trulli is one of the easiest ways to prepare whole fish. Just a few easy slices and quickly into the oven for roasting. Puglia, located in the heel of Italy’s broad boot, is as famous for its seafood traditions as for the conical-roofed dwellings, trulli, that dot the countryside around Alberobello. Marzovilla emigrated with his family to the United States at age 10, and his elevated Southern Italian restaurant, I Trulli, nods to the great food culture of his home region. Each Christmas Eve, his restaurant’s Feast of the Seven Fishes is packed to the proverbial gills with simple yet spectacular dishes like the wood-fired, whole-roasted fish. Heat oven to 400°F. Rub baking dish with olive oil, and add fish. Use tip of small paring knife to make slits in skin, and along the underside. Stuff each slit with garlic slice. Stuff the inside with herbs and salt. Drizzle outside with olive oil. Cook for 25–30 minutes. Serves 4. Produttori di Manduria 2017 Aka Primitivo Rosato (Salento). Coral pink in color, this rosato offers raspberry and watermelon on the nose, with tangy, tart red fruit taking center stage on the palate. It’s light in body, with a healthy vein of acidity that helps extend a sunbaked stone finish.